In large bowl, beat 3 cups powdered sugar, the butter, vanilla, 1 teaspoon almond extract and eggs with electric mixer on medium speed, or mix with spoon. Stir in flour, baking soda and cream of tartar. Cover and refrigerate at least 2 hours. Heat oven to 375°F. Lightly grease cookie sheet. Divide dough in half. On lightly floured surface, roll each half 1/8 inch thick. Cut into desired shapes with 3-inch cookie cutters. Place about 2 inches apart on cookie sheet. Bake 5 to 7 minutes or until edges are light brown. Remove from cookie sheet to wire rack. Cool completely, about 30 minutes. In small bowl, beat all glaze ingredients except food colors on low speed until smooth. Divide among several small bowls. Stir desired food color, one drop at a time, into each until desired color. Decorate cookies with glaze and other decorations as desired. You can divide this recipe in half for a smaller batch of cookies. Roll dough to an even thickness by rolling over two wooden dowels or rulers. Use dowels or rulers in the desired thickness, and place them on opposite sides of the dough. If you’re familiar with Betty’s classic sugar cookie recipe, this recipe needs no introduction. It’s simply your guide to making more of the cookies you love. If you’ve stumbled upon this recipe in search of a cookie exchange quantity of sugar cookies, lucky you! This scratch-made sugar cookie recipe has been delighting families for generations — check out the review from our home bakers below. What makes this cookie extra special is the powdered sugar, which not only lends sweet taste but also creates the delicate texture everyone expects from a sugar cookie. It’s easy to make the dough a day ahead and store it in the refrigerator. As with all sugar cookies, the dough is much easier to roll out and cut when slightly chilled. If you’ve left your dough in the fridge for longer than two hours, you may want to give it a few minutes to rest on the counter at room temperature before rolling. 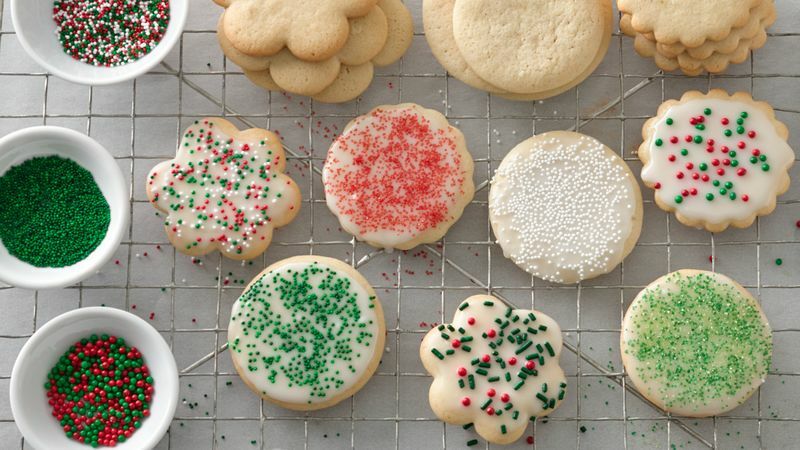 Another key to making perfect sugar cookies is using the right baking sheet, i.e. a one without sides, so the heat can circulate evenly. For more tips like this these, read up on how to make sugar cookies. And if you’re looking for a twist on the traditional, we’ve got plenty more sugar cookie recipes where these came from!